Today’s intermittent thunderstorms brought rain, wind, cooler temps and a change in plans for my first today. I’ll save purchasing new varieties of herbs for a sunny day! After waiting for a break in the weather most of the day, I finally dashed to the library to view the April art exhibit. 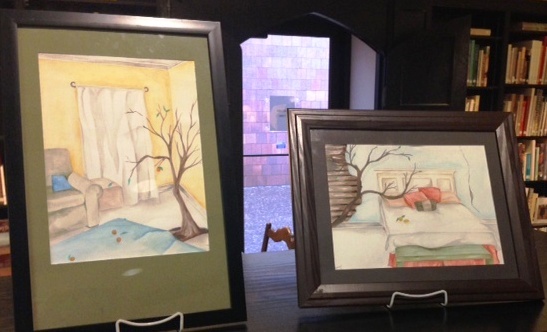 This month the exhibit features the work of Fred and Amber Mintert. Both are art educators in area schools and active artists, locally. Amber’s work focuses on watercolors. The paintings on display showed her talent and her whimsy. She had paintings of birds, a lazy cat, and enigmatic interior scenes that featured treas. Because my symbol for this year is the bird, free from its cage, I was interested in seeing her watercolors. 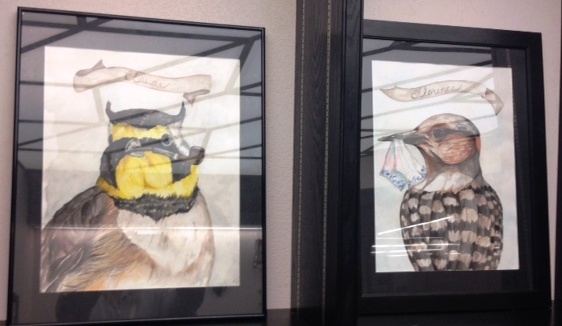 These are really what I would call bird portraits, showing only the upper portion of the bird, and two of the paintings captured the whimsical aspect. “Florence” held a blue and white handkerchief delicately in her beak, while “Claude” stoically puffed on a pipe. I couldn’t help but smile. There are several other bird paintings on Amber’s website that I am very interested in and a lovely, playful print that I adore called “Moonlit Dance”. In the next room I enjoyed the cat watercolor. Because of my rescue efforts recently of an abandoned mama cat and her TWO litters of kittens, my family teases me about becoming the crazy cat lady. That’s NOT going to happen. The mother cat and her two baby boys will be going to new forever homes soon, I hope. 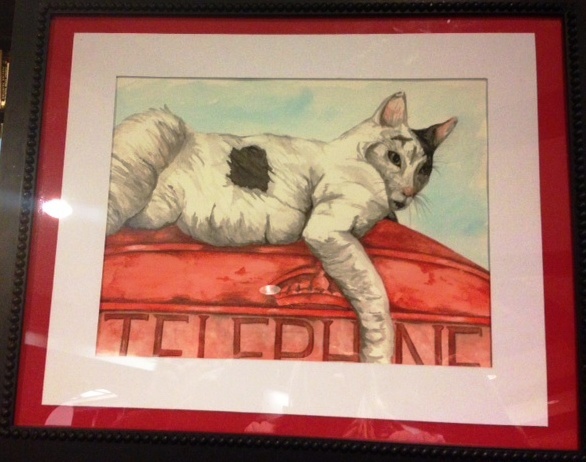 So I could appreciate this painting…a cat I don’t have to feed or care for! Her coloring and face reminded more of my daughter Adriel’s cat, Beaker, who sadly passed away last year at an old age. And lastly, I smiled as I examined Amber’s more intriguing works, interior scenes with trees. These were not potted Ficus Trees, but a fruit tree growing out of the floor and a bare branch overshadowing a bed. Wonderfully interesting! I love trees and have an affinity for them, no matter where they take root. I’d like to know the story behind these paintings! 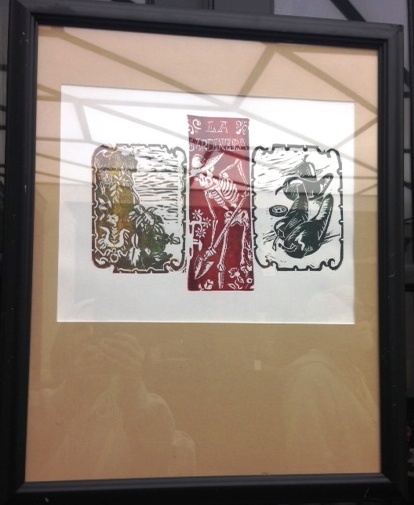 Fred draws on his Mexican ancestry to create woodcut prints. His “Day of the Dead” images are considered autobiographical, capturing different moments in his life. On display were prints representing him as a father, a gardener and in other roles. I loved the earthy colors. What a unique and creative combination of art and heritage! I enjoyed viewing the paintings and woodcut prints. And I appreciate this oft overlooked section of the library, which exhibits local artists’ work each month. I look forward to May’s exhibit!